Julian, Tawno and Jason Watson Todd were born and bred on the island. Like so many others, their parents had arrived in 1969 and never left. Their mother, Helga, is of German descent and famed for founding Las Dalias hippy market. Their British-born father, Martin, was a private art dealer, and opened one of the pioneering art galleries on the island: El Mensajero in Santa Eulalia. The children have since gone on to make their own positive impression on the island with their company, Terravita. We met up with Jason, its co-founder, to learn a little of what lies behind their compelling colour-lit muraled exterior on the Santa Eulalia to Eivissa road. As it happens, even more than one might think; as the following story of its creation reveals. As soon as Jason had qualified as a certified landscape designer in Britain, he returned to Ibiza to realise his long-held dream of designing and constructing gardens enhanced with environmentally-friendly elements. As luck would have it, his older brother, Julian, had also just returned to the island, so together they forged forward to create Terravita (Earth Life) in 1999. Things got off to a slightly bumpy start. Julian’s home was their base, and a clapped-out, lurid orange 4x4 Lada was their company car. Their first job was to build a natural pool in San Josep, “Julian and I built the whole thing singlehandedly. Not surprisingly, it cost double what we’d quoted, leaving us to cover the shortfall. We certainly learned the hard way!” Soon after, their middle brother, Tawno, boldly joined the family force. They later emerged from a crisis meeting with Jason appointed as soft landscaping manager, Tawno as hard landscaping manager, and Julian as the office manager. 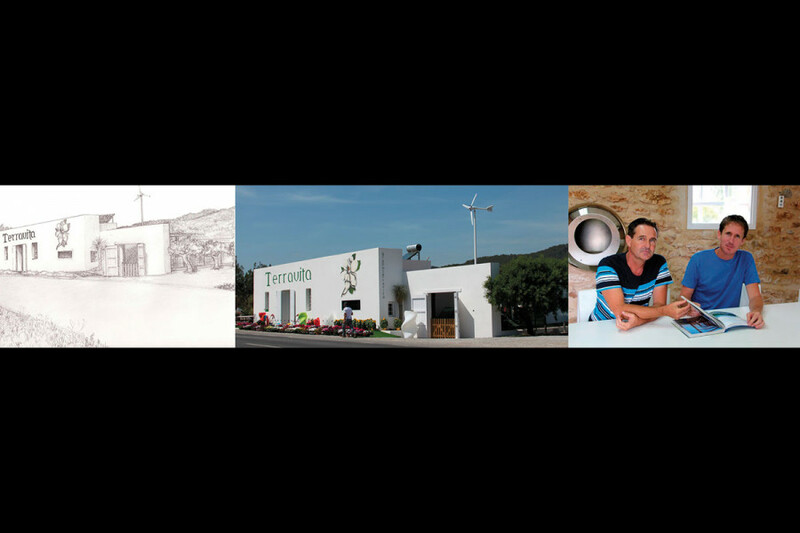 Soon after, they moved into their first official office space, located on the San Carlos to Santa Eulalia road. From this moment on, the rise of Terravita was meteoric. The company grew from a three brother family outfit to one employing over 50 employees. In 2005, they expanded again into a space on the Es Canar to Santa Eulalia road. Things continued on very satisfactorily until the summer of 2008, when the financial crisis shook the foundations of the company, forcing Terravita to urgently restructure. Tawno also moved on to pastures new. Between 2008 and 2009, Jason and Julian took the economy’s sudden downturn as a prompt to put their heads together, rethink their strategies, and rise above the inherent challenges. This they duly did. With the help of added silent investment from a keen supporter of renewables, Terravita gardens gave birth to Terravita renewable energies. Near on immediately after followed Terravita maintenance; focusing on the upkeep of gardens and outdoor spaces. In 2010, the whole outfit shifted to their existing premises; making room for Terravita interior/exterior decorations and Terravita construction. And so the fully-fledged Terravita group was complete; still striving to seamlessly marry quality with respect for the environment, and now also offering either stand-alone services or a comprehensive package designed to satisfy all of a new home owner’s needs. Although it is not conditional to what they offer, sustainability underpins all that they do. Their keen attention to the environment’s needs starts with optimising on new builds’ insulation and damp-proofing. Later offering: renewable energy systems such as solar installations and wind turbines; solar-powered underfloor heating; household wastewater recycling systems to generate free water for the garden; high-end irrigation that consumes less water; and salt pools which prove healthier and cheaper.